This one is a whole bunch of liquor. 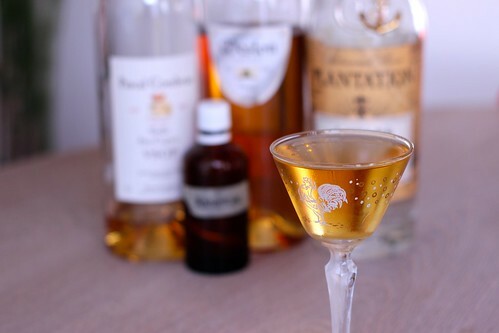 Instead of just a shot of one spirit, it’s simply a blend of 3 shots, with the absinthe added as an afterthought to make it a “cocktail.” Lommebogen and Café Royal have the same recipe, but Savoy has two different recipes for this one. The one that matches the other two books is actually Savoy’s #2 version. The Savoy #1 is quite a departure, and seem much more approachable. Another place to use a little crème de menthe. The main recipe is exactly what it says on the tin, and is a strong punch in the mouth. It’s a reasonable blend of spirits, but really not much of a cocktail. The Savoy #1 is the same concept, with a main spirit dressed up a little—just that this main spirit is the more approachable vermouth. This is essentially drinking vermouth straight up, which isn’t bad, but not my preferred evening tipple. That said, it did grow on me throughout the drink. The mint and orange blend nicely with the vermouth, so it would be an interesting twist for someone who really loves vermouth.